The poll just happened to come at the worst possible time for the government, and for that reason not too much should be read into it unless it gets a friend, preferably from a different company. Federal factors often influence EMRS state polling, and the poll went into the field less than a week after the carnage in Canberra, which probably wouldn't have happened without three of the four Tasmanian Liberal Senators bobbing up on the pro-Dutton side. On the second day of the poll the Premier copped a front page Mercury headline reading "I Did Not Tell A Lie", accompanied by a remarkably unflattering photo, all a reference to claims made in the Angela Williamson saga. The new material in the Williamson case was really just claims made by Williamson's submissions in her Fair Work action, and the claims have not at this stage been tested or ruled upon, but some of the reporting painted the claims as more or less established facts. In the leadup to this poll there had also been embarrassment for the government when a press conference by the Health Minister Michael Ferguson was hijacked by a clinician expressing more of the long-standing concerns held by professionals with the health system. Although the government did their best to welcome the intervention, Ferguson is also under the pump over the Williamson matter, and probably only needs one more strike before the press put him on the embattled species list. We've seen this story before, especially in 2006 - governments struggle through their term then suddenly recover within sight of the election as voters realise only one side can win and switch to that side to prevent minority government. After the election, the government falls away again. But the rise and falls in EMRS this time have been faster than before. Aside from questions about the reliability of EMRS that I continually raise here, and even ignoring what a shocking poll cycle this was, it does raise the question of how much of the government's rise and fall is down to campaign factors. There were Labor's mistakes on pokies policy and Labor's misallocation of efforts when they were expecting an early election that never came, but the Liberals had massive advantages in campaign resourcing and assistance from third party campaigns. What's interesting about this poll given the hit taken by the Liberals is that only four of the 11 points they dropped went to the Labor Party. Labor sits on 34% for the fifth time in the past seven polls - indeed, it hasn't been higher than that level (after redistributing undecided) for around ten years! Rather, we see blatant vote-parking by Liberal voters, with 14% of the sample now saying they would vote Other. This is after Others polled only 6.8% at the election (and that includes the Lambie Network). EMRS is a live phone pollster, and live pollsters of any kind are prone to high Greens and Others votes, though they did manage to get the Others vote right at this election. What I think we're seeing here is voters who voted Liberal not out of positive enthusiasm but because they wanted to avoid minority government, disliked Labor's campaign, or were influenced by advertising (though after seeing plenty of well-funded campaigns fail because they were selling a bad product, you won't see me putting too many eggs in the last basket.) Now that the next election is years away, Labor's pokies flop is a fading memory and the glossy brochures are no longer in the letterbox, these voters are for whatever reason not enamoured with the government they voted for. But they're still not that convinced of the alternatives, so they plump for None Of The Above. This is simply assuming the swings in my interpretation of the poll were reflected statewide, so it's a very approximate model (which scarcely matters with no election soon anyway). The Greens probably wouldn't get their seat back in Bass, especially with the loss of an incumbent's personal vote, though it would be pretty close. In Braddon I've left a question mark over a possible Others seat following the recent performance of Craig Garland in the Braddon by-election, and given that fourth-party candidacies have often done well there recently. That said, even if Others have a whole quota, it's usually split between several different forces, so probably isn't enough to win. In Lyons I'm continuing to assume the same even split between Rene Hidding, Guy Barnett and Mark Shelton as seen in the state election, meaning that half a quota for the Greens would be nowhere near enough. If one of them retires I may change this assumption. All up I get 11-12 Liberal, 11 Labor, 2 Green (maybe 3 if lucky) and maybe someone else. 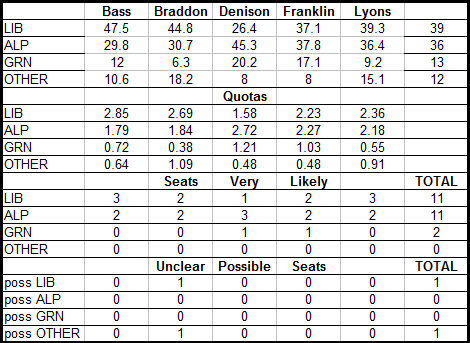 Even on these numbers though, the Liberals aren't that far from holding two in Denison. It's a long way to the next election, as we've seen. What will be more interesting is if we start to see Labor make progress up towards 40%. For now, I have decided not to restart my polling aggregate for Tasmania yet. I'd like to see at least one poll from another pollster. Recent EMRS Preferred Premier polling has been quite mysterious. Rebecca White shot to huge leads last year after becoming Opposition Leader. In the history of Newspoll preferred leader polling, every Opposition Leader who has done this against an established Premier has gone on to win the next election. Is the difference just that EMRS isn't Newspoll? Is Rebecca White an exception to the rule who is so personally popular (at least during her honeymoon phase) that she can outshine sitting Premiers even while her party is losing? Did Labor blow a position from which they should have won outright based on White's personal appeal, and blow it in a way no other Australian Opposition has ever done? White's own popularity must have something to do with it, but the lead she has taken now (46-38) cannot be put down to "honeymoon effect" alone. She is 18 months into the job and has led her party to a result that, while showing signs of rebuilding from a very low base, still fell well short of expectations. My suspicion regarding this result is that Will Hodgman's personal approval has finally taken a whack. While that may seem self-evident, Preferred Leader scores are not the same thing as personal approval. The few readings of Will Hodgman's personal appeal via questions of the form "Do you approve of the job Will Hodgman is doing as ..." have had him on about a net +15 since at least 2010. It may be that he has finally taken some damage (from the Williamson issue or whatever else) and is no longer as popular now, while White's appeal has not yet been diminished by her loss. However, a direct measure of his popularity would be needed to confirm this. I may add more comments on this poll later.